The Erie County Legislature's Health and Human Services Committee, whose chairman vows to pass legislation that "gets it right" on limiting e-cigarette access by minors, heard from educators who shared concerns including what they believe is a blatant effort to market them to young people. 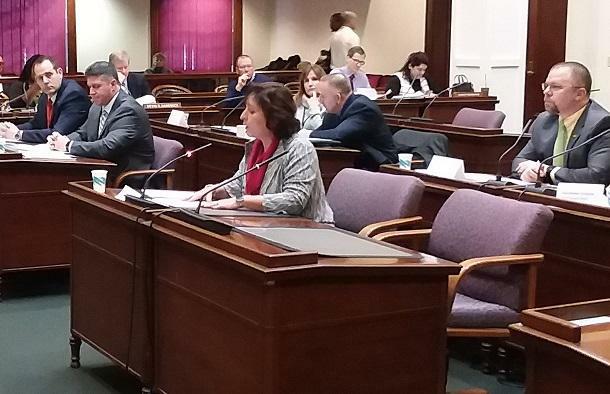 Guest speakers at Thursday morning's committee meeting included principals and other officials from four public school districts: Alden, Depew, West Seneca and Williamsville. They shared information including the disciplinary measures enacted when a student is caught with a vaping device. Carol Townsend, principal of Depew High School, testifies during an Erie County Legislature Health and Human Services Committee hearing on e-cigarettes. Among the problems, they told lawmakers, is that vaping has risen among students among all demographics and cliques. "To see the change in the last couple of years, initially it was cigarettes, tobacco, chewing. We went through an episode when we put a strong emphasis on educating our kids, having our student leadership kind of take control of the building and and put together initiatives, and we kind of stomped that out," said Bkill MacCowan, assistant principal of Alden High School. "The problem with this is we have those leadership kids that are doing this themselves." E-cigarette and vaping products utilize flavors and attractive designs of devices and packaging that, both educators and lawmakers suggest, are intentionally luring younger people toward them. Among the misconceptions, it was discussed in a previous hearing by this committee, is that vaping products provide a safer alternative to traditional tobacco. But vaping products contain nicotine and, critics say, are just as addictive as the smokes they were intended to replace. Lawmakers are considering legislation that would raise the minimum age to purchase vaping products from 18 to 21 yers old. "There's more. We should be looking into the flavorings and the actual marketing of the whold product," said Legislator John Bruso, who chairs the Health and Human Services Committee. "How does a product that's designed to help adults quit smoking turn into a little flash drive-looking item that a kid can have, an adolescent can have, in school?" Tobacco products, where they may be sold legally, are displayed behind the counter. Speakers testified that many vaping products are still placed where they may be viewed up close by minors, including small children. A generation ago, children were lured toward tobacco products through candy cigarettes, which included sugary sticks with red dye on one of the tips to simulate the lit end or bubble gum wrapped in paper, which users would "smoke" by blowing a small amount of powdered sugar through the opposite end. Now, educators complained at Thursday's hearing, the colors of vaping packaging are catching the eyes of children. Jason Winnicki, principal of West Seneca East High School, stated that his own young daughter has taken notice of the devices on store displays and, to his dismay, thought they looked "fun." He was asked if lawmakers could succeed in keeping vaping products away from children. "I'm confident that we can do this together. I think if we rely solely on one group, whether it's the legislature or the schools or the medical professionals, we're going to fail," Winnicki said. "We need to do all what we can do, whether it's work on the education piece in the schools, increasing regulation through the County Legislature or the State Legislature, so that we can get the e-cigs away from the eye level of an eight-year-old girl." Bruso, when asked what his governing body can really do to eradicate the problem, told reporters he isn't sure what the legislature can do but they will work to put out information as they write local laws while urging the state to pass mandates that can be sent to local governments. In the meantime, Bruso is hosting another public hearing on e-cigarettes, March 6 at Lancaster Opera House.